Click here to go directly to Deleting a member. From time to time, your club members may need to withdraw from active association with your club. They may be travelling on business or military service, or recovering from a lengthy illness. In these cases, you can retain these members on your membership list as Inactive Members. It is important to keep your ClubRunner Member List updated to reflect these changes. 1. To access the Member List feature, you must go to your club homepage and log in. Then, click on Member Area near the top right of the page. 2. Along the top of the screen you will see several tabs. Click on the Membership tab. 3. Now, click on Member Lists. 4. You are now on the Active Members List page, where you can browse a list of all currently active members. 5. To set a member as Inactive, click Change Status in the Action column on the same row as their name. 6. You are now on the Change Status page. There are three choices. Click on Terminate Membership. 7. First, enter the date the membership is to become inactive. By default, this is set to the current date. However, you can select a future or past date as appropriate. Note: Rotary Clubs cannot set the date of termination more than 30 days into the past, or 30 days into the future. 8. Next, select the reason for deactivating the membership. Check on the appropriate reason, or specify one if it is not otherwise listed. 9. To confirm the change, click Terminate Member. Rotary Clubs have the option to opt out of notifying Rotary International of the membership change. Note: Once any member is terminated, that terminated member is no longer able to login to ClubRunner. We recommend deleting members who were created in error. We do not recommend deleting members who quit the club, because they are tied to reports. If you delete the member, you will not be able to get the member back. 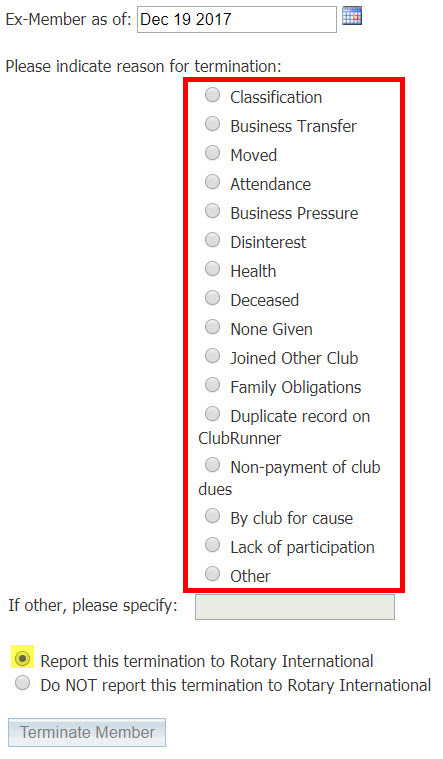 Most Clubs like to keep inactive/terminated members for historical reasons. 1. The former member no longer appears on the Active Members list. However, you may view their details on the Inactive Members List. On that list, you may also permanently delete the member. To access this list, click on the Inactive Members List link under the Members header on the left side. 2. Here, you can view and edit the details of all your inactive members. To permanently remove a member, click on Delete in the Action column. This will permanently delete the member from your rolls. You will be prompted to confirm this choice. 3. 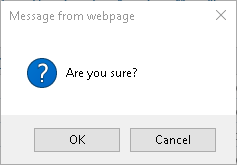 You will be prompted to confirm this choice. Click OK to confirm deleting the member. Note: If you see red message boxes such as "You can not delete this member because he/she is in one or more invoices" or a message similar to this, this means there are references in your Club database to this member that would be broken if you deleted this member. You will not be able to delete these members because this would cause issues with your Club database. How do I Reactivate an Inactive Member on the District?